Sweden's Bad Habit has been around since 1986 with most of their popularity found overseas. They have been consistent purveyors of fine melodic hard rock with the most notable releases being After Hours and Adult Orientation. Bad Habit was last heard from on 2005's Hear Say, an album that found them somewhat heavier and so garnering mixed reviews. Above And Beyond is being hailed as a return to their classic form, straight melodic rock within an AOR wrapper. My first impression is agreeable to this. I found Above And Beyond to be a thoroughly consistent, tightly woven, and highly entertaining offering from Bad Habit. From beginning to end, Above And Beyond treats you to complete songs filled with melodic arrangements, big choruses, passionate vocals and sizzling solos. There isn't a dull moment to be found here, only consistency. For some this may be Bad Habit's downfall especially if they mistake coherency and consistency with monotony. Bad Habit is not reinventing the wheel here by any means. What they are doing is putting high performance wheels on a well-oiled racing machine. If there is flaw it is certainly not in the caliber of the music, but in the often rather repetitive and somewhat cheesy relationship lyrical content. However, I will be quick to add that the songs that I enjoyed most were built upon heavier riffs and a more hard rock tempo including 'I Don't Want You,' 'Don't Want To Say Goodbye' and 'I Believe,' a fine guitar driven rock and possibly the best song on the work. 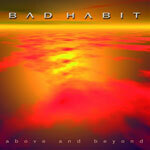 Bad Habit's Above And Beyond is a return to the band's classic form of melodic rock. The best stuff, however, is when Bad Habit pushes the music more toward melodic hard rock, nailing us between the eyes with heavier riffs, wilder lead vocals and bristling guitar work. Above And Beyond is a complete and entertaining album.